Teapot Centerpiece Hand Painted Sign DIY started when I was setting up to serve tea at church and my friend’s grandson decided to help with the teapot and broke the lid. 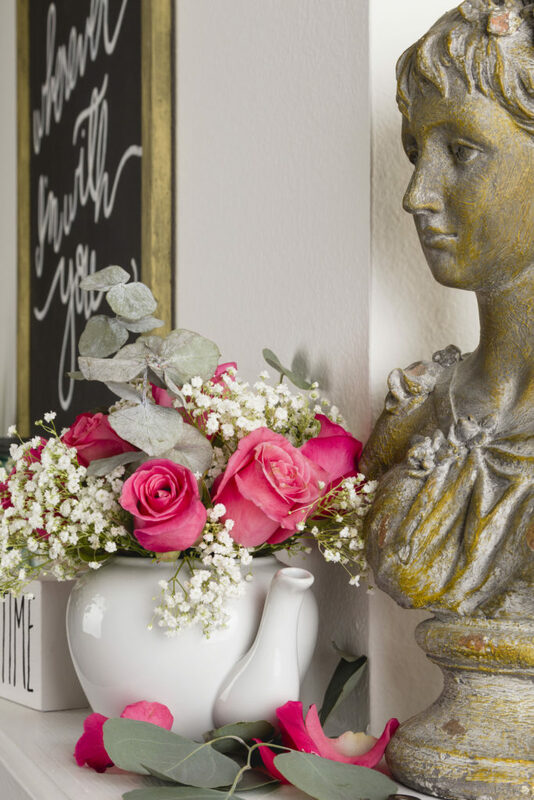 My friend wanted to discard the teapot since the lid was broken, but I saw the teapot as a perfect vessel for a floral arrangement especially for tea time. 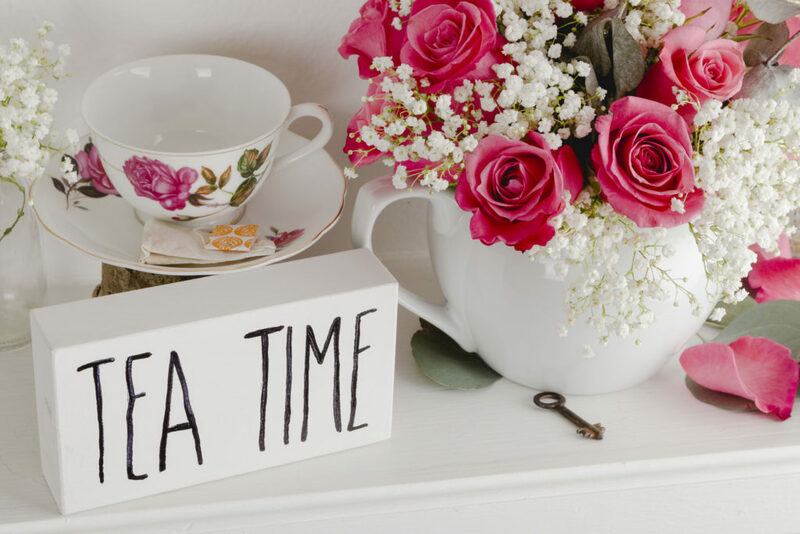 Why not add a hand-painted sign for some whimsy to the tea time vignette? 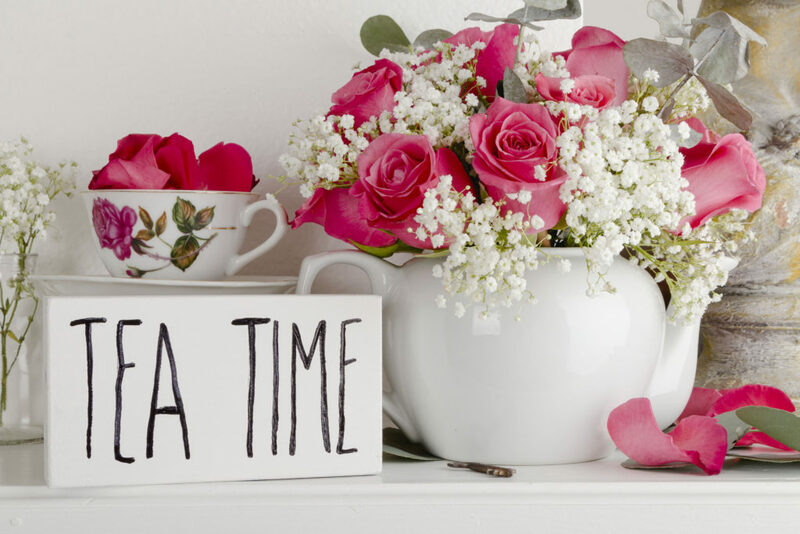 Making tea time special with pretty floral arrangements, lovely tea cups, a touch of whimsy and of course tea. 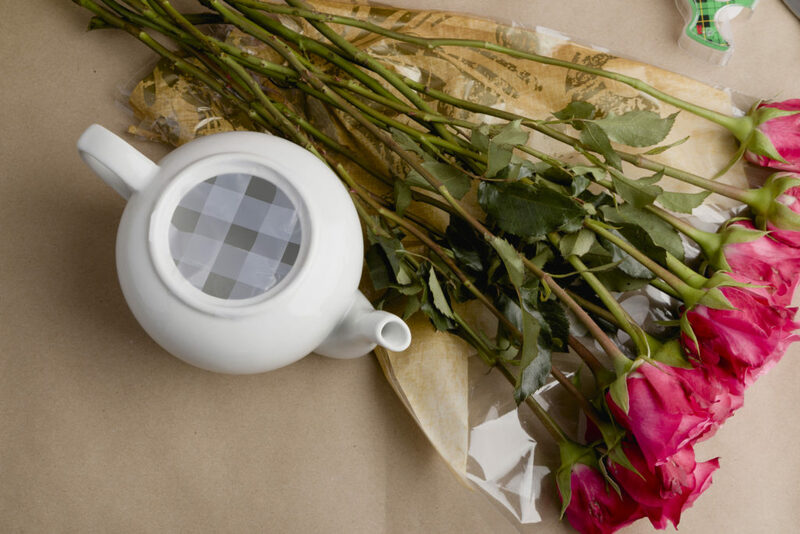 Sharing tea in the afternoon is the perfect time to unwind and reconnect with family and friends. 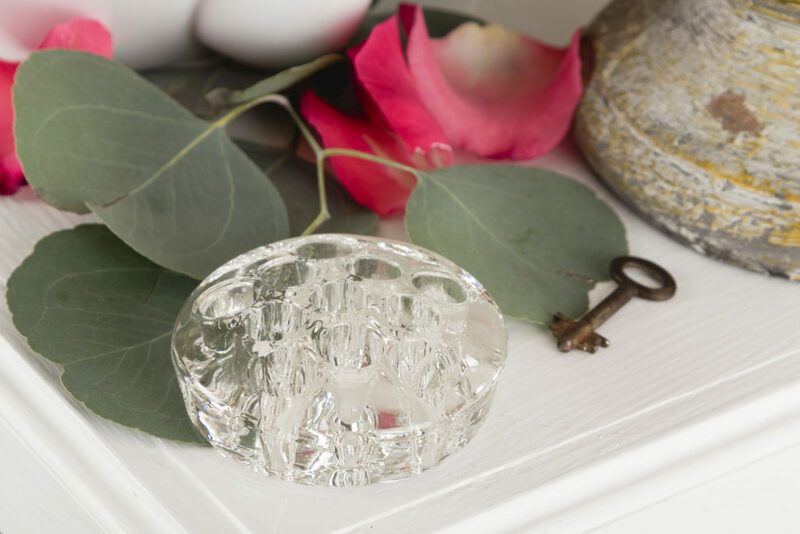 Become an insider and have all our FREEBIES. 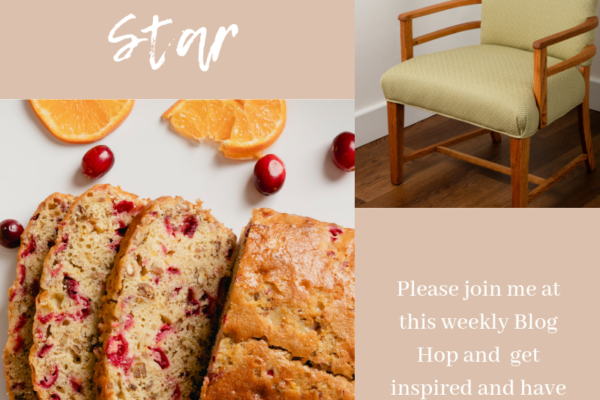 DIY inspiration, recipes and more delivered straight to your inbox. Don’t miss out. Subscribe today. 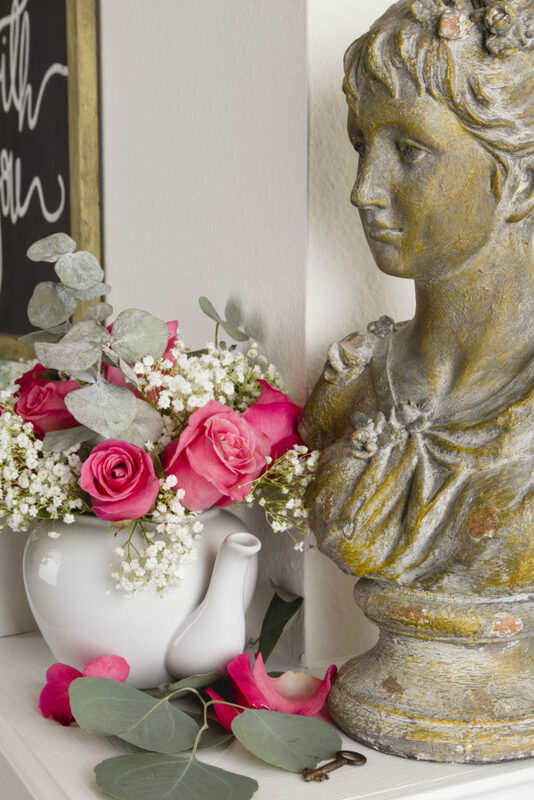 I purchased three types of floral from Publix (local grocery store) roses, baby’s breath and greenery, in spite of the small amount of floral used the teapot centerpiece made a pretty arrangement. Using scissors cut open all the floral and greenery warping. 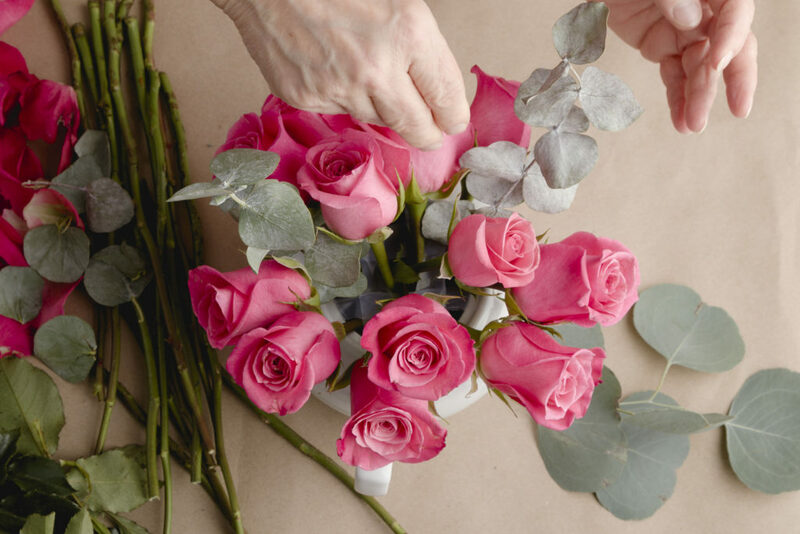 Then remove outer petals from roses. Also, remove all the leaves from roses. Tape the top of your vessel. 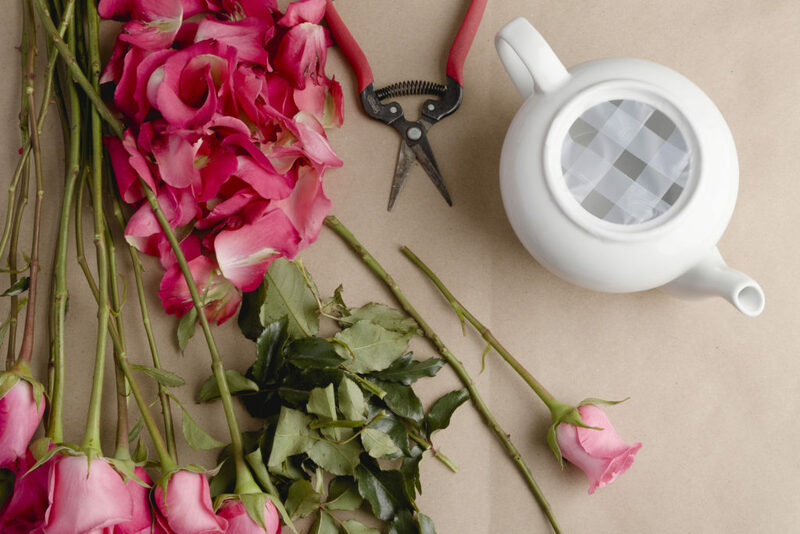 Using floral snips cut the roses to the same height (about 2 to 3 inches taller than the vessel). 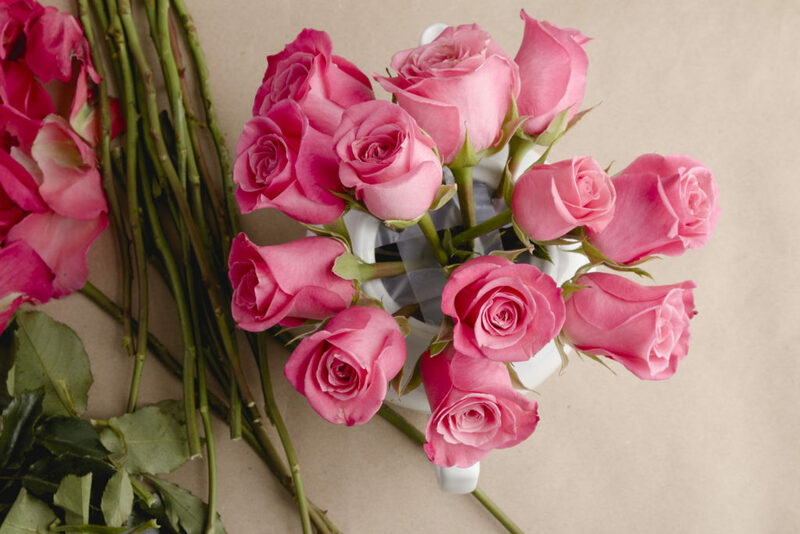 Start by cutting just one rose then check how it looks with a 3″ taller rose placed in the center. Adjust height if necessary. 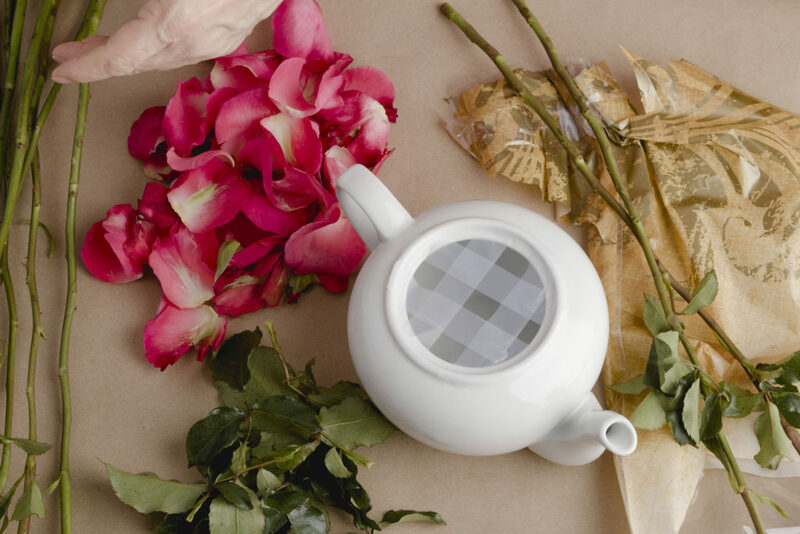 Once all the roses are cut to the same length start placing them in the vessel between the tape grid placing them crossing back and forth creating a grid inside the vessel as well. 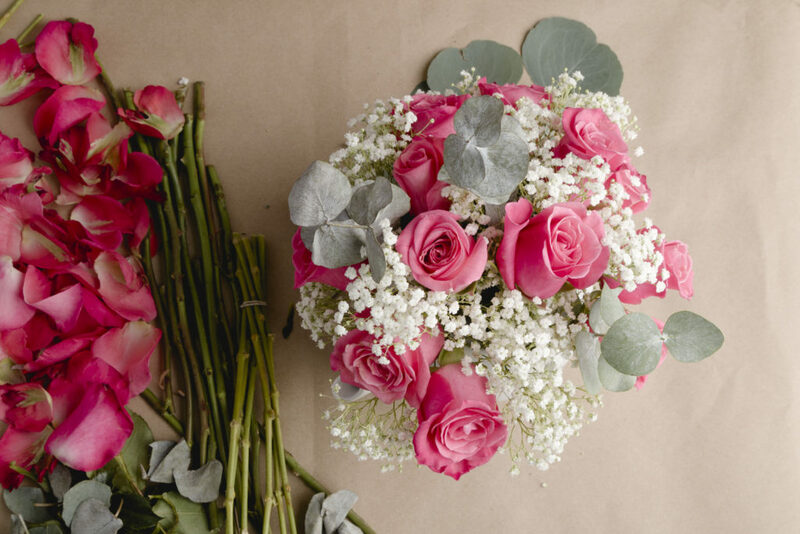 This way they will support the top roses, baby’s breath and greenery. Then I added the eucalyptus. 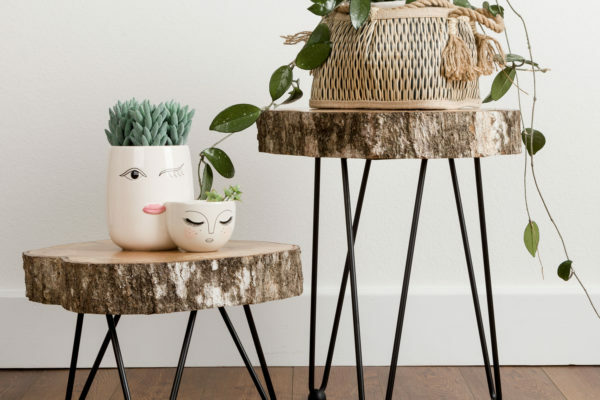 There were only three eucalyptus so I had to move them around a little to see what I liked best. 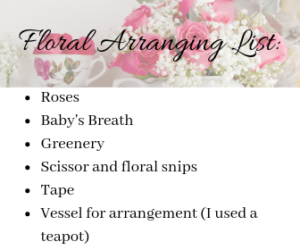 Next, start cutting the baby’s breath one piece at a time and filling in around the roses. I love to make these cute little block signs to add to vignettes. 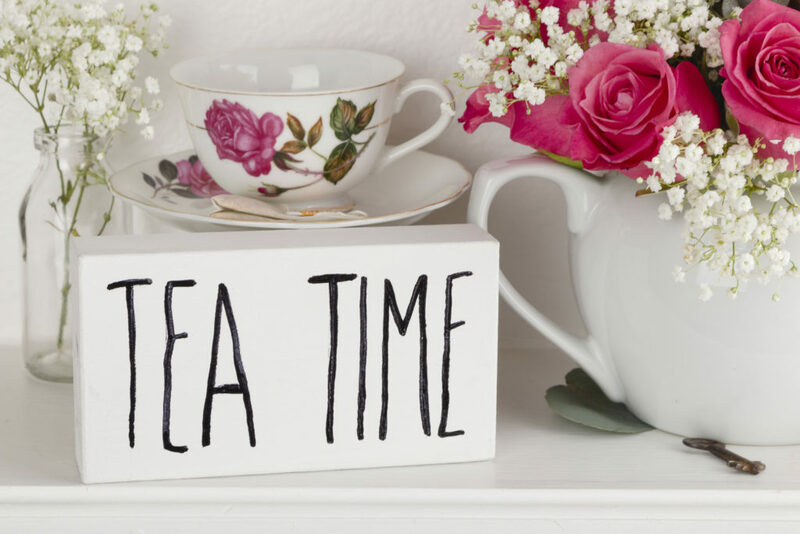 My Tea Time sign was Rae Dunn inspired and makes the perfect addition to my afternoon tea time vignette. You can easily make some too, see how in my earlier post HERE and grab the free design with the form below. The instructions are so simply and they are a breeze to make. I just love them. 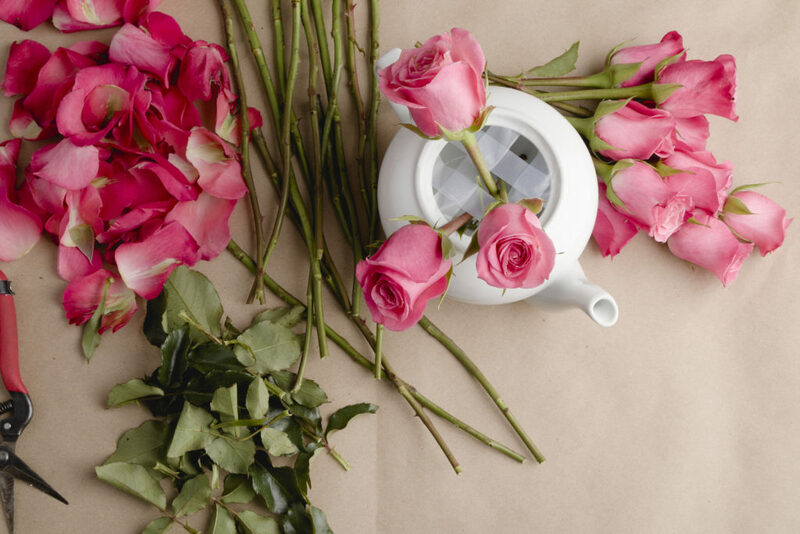 They are perfect for Mother’s Day, tea parties, and everyday tea time. I would like to thank you so much for stopping by I also hope you have enjoyed the post. 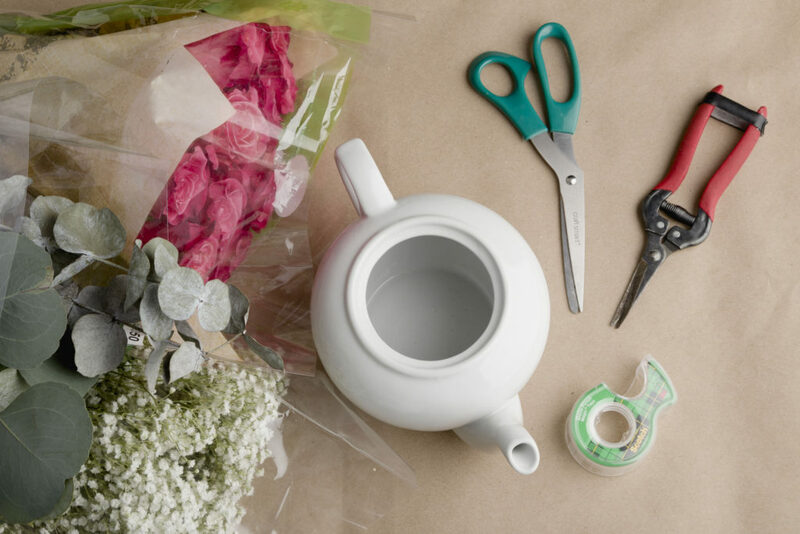 Are you feeling inspired to create a beautiful, but super easy spring floral arrangement? I find it therapeutic to create due to my complete focus on the project, therefore I am not worrying about anything and just enjoying the process. 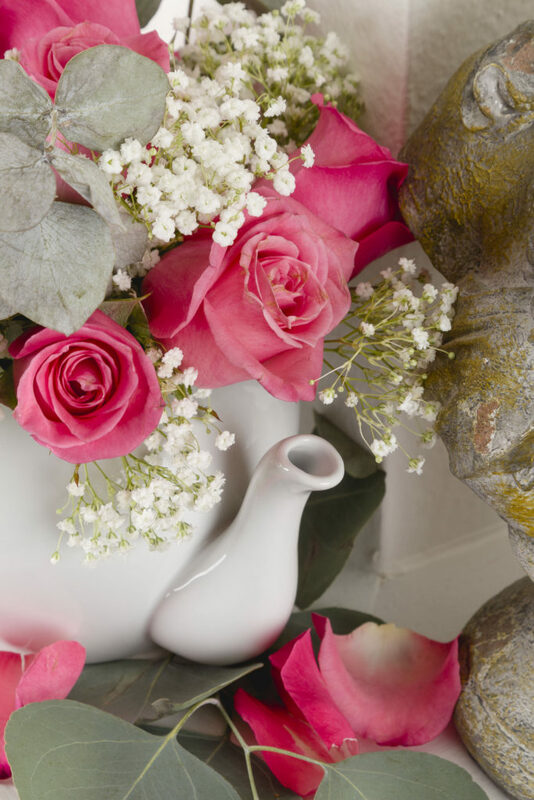 Teapot centerpiece and hand painted sign DIY was a blast to create, therefore I will be arranging more spring and Easter arrangements and wreaths. I love that you decided to visit today. Please leave a hello in the comments below. 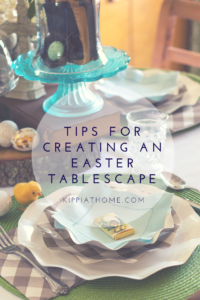 What are planning for spring decorating? Wreath making? Painting? Crafting? 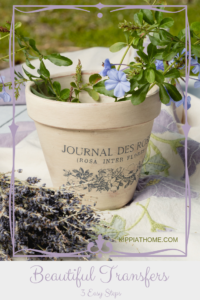 I am going to be starting some window treatments DIY posts, but I wanted to ask you first if you would like to learn about making Roman shades or valances?